It took five years to build the Croton Aqueduct—the engineering marvel that brought fresh upstate water to Manhattan through a series of pipes and reservoirs. When this incredible delivery system of clean drinking water finally opened on October 14, 1842, a celebration was in order. The most thrilling moment took place at City Hall Park, when the park’s new Croton Fountain was turned on—and a magnificent propulsion of Croton water rose dozens of feet in the air. That’s some water spray, right? But the Croton Aqueduct really was something—it even inspired a song, the “Croton Jubilee Quick Step” (right). 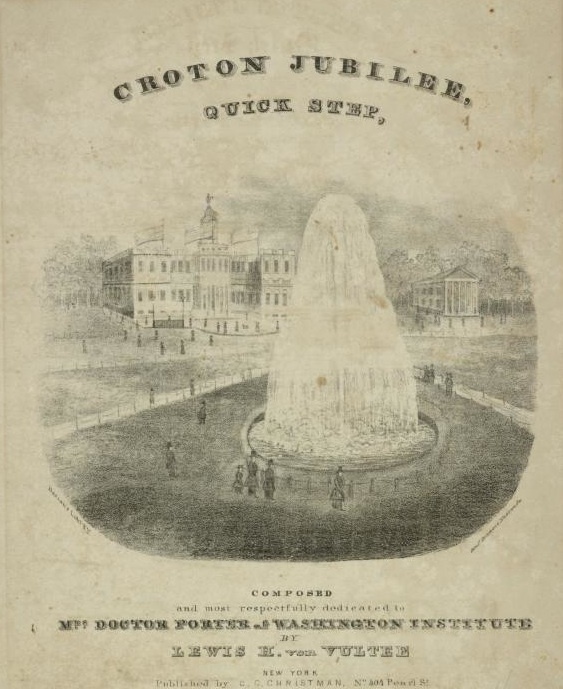 “On opening day in 1842, President John Tyler was on hand to witness the plume from the Croton-fed City Hall fountain surge 50 feet high,” wrote The New York Times‘ Sam Roberts in his new book, A History of New York in 101 Objects. President Tyler wasn’t the only dignitary in the crowd. Former presidents John Quincy Adams and Martin Van Buren also attended. 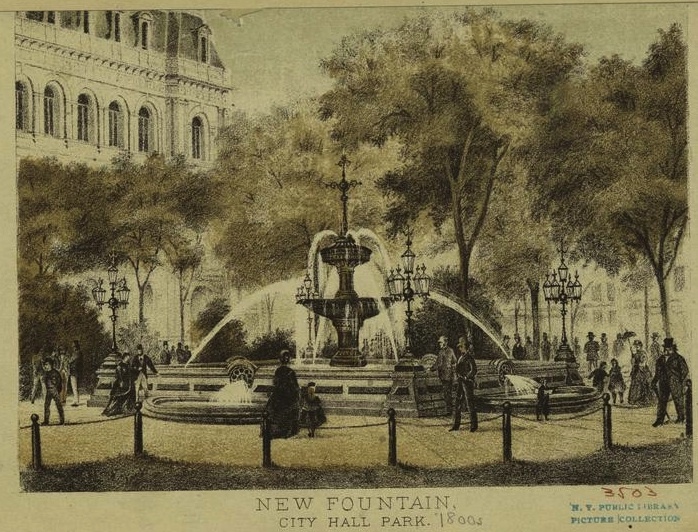 The Croton Fountain, which had a 100-foot stone basin, was the city’s first decorative fountain. 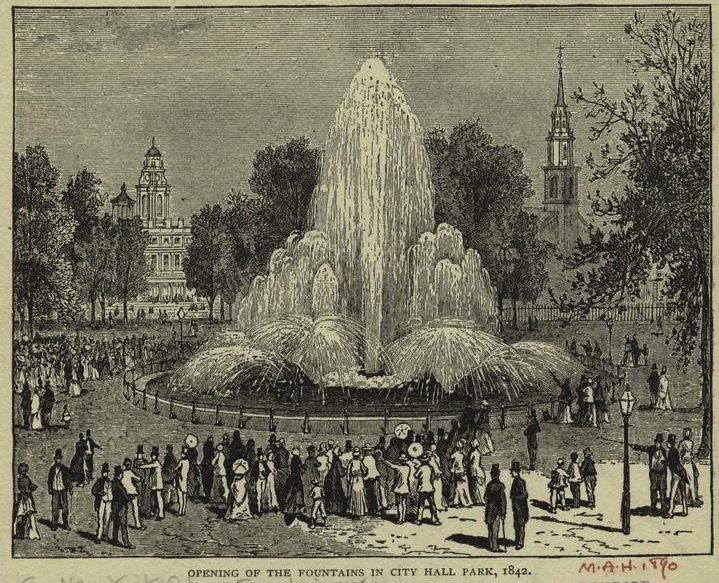 Its spire of water dazzled New Yorkers until 1871, when a new fountain designed by Jacob Wrey Mould (he designed bridges in Central Park and decorative elements at Bethesda Terrace) replaced it. The second fountain didn’t spray water quite so high. But it was Victorian spectacular, with several pools and gas-lit bronze candelabras. When Victorian style fell out of favor in the 1920s, it was shipped off to Crotona Park in the Bronx. 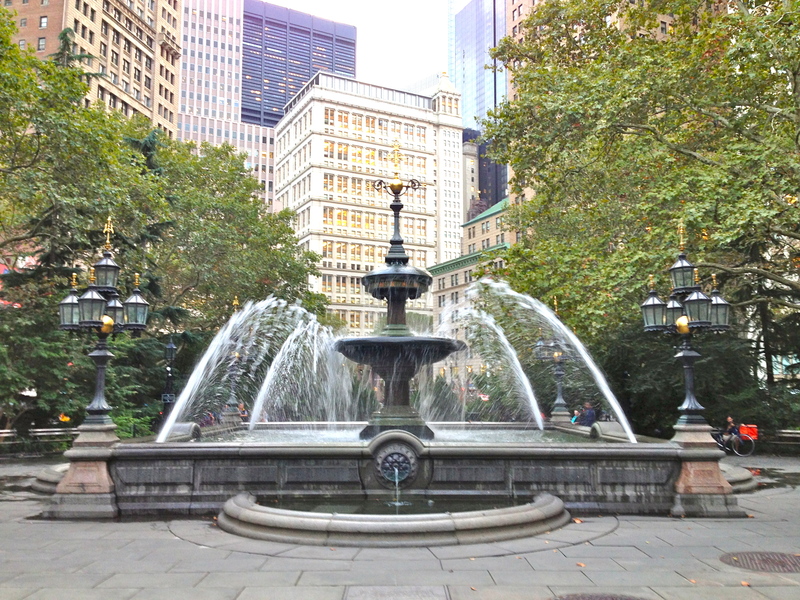 Seventy years later, the Jacob Wrey Mould fountain was restored and reinstalled in City Hall Park in 1999. There’s no 50-foot plume of Croton water, unfortunately, but it’s a lovely fountain nonetheless.